What happens if we agree to abandon our cherished habits of logic, our conceptions of space and geometry; if we stop believing our eyes and start believing our ears instead; if we decide to believe in the magic beyond the illusion, the ghosts haunting spaces; if we agree to invert the laws of rationality, just to see? What would such excursions achieve beyond an initial confusion and disorientation? Could the worlds we access by way of these excursions have a feedback effect on our own, supposedly reliable world? If one’s cosmology is the way in which one explains the world to oneself, could art installations become machines, devices for generating new and different cosmologies? In moving away from two- and three-dimensional art into multidimensional spaces, installation art makes a radical break with the practice of representation. These works do not seek to reproduce something from the world in pictorial or artistic form; nor is it about the visualisation of concepts or abstraction of existing forms. Something else is going on. The binary relationship between original and copy that has historically grounded practices such as photography, painting and sculpture is rendered irrelevant, or at least subsumed under the larger body of the works; relegated to a secondary position as a part of the whole, rather than constituting the work itself. This break with representation also entails a move away from tendencies of anthropomorphism and illusionism. By severing the umbilical cord between the work of art and the “real world”, installation art makes way for hyperspaces, other worlds: the impossible, kaleidoscopic spaces created by moving and folding mirrors in Laura Buckley’s Mechanical Poem; the auratic world of Mark Titchner’s When We Build Let Us Think That We Build Forever, in which symbolism and oppression are the dominant languages; or a monumental stepped helix that could have been the set for a reconstruction of Marcel Duchamp’s Nu descendant un escalier N2 (1912) in the Escherised space of Graham Hudson’s installation On Off (2008). Futurism incorporated the Cubists’ revolutionary style into a radical political agenda. With a style that involved a fragmentation of perspective and the scattering of vision and matter, the Futurists adopted a new viewpoint, situated within the work rather than simply in front of it. This spatial rearrangement and its attendant new perspective extended to the viewer, who was now able, by way of the artwork, to access the world of the future and experience the urban energy that characterised the era, catching a glimpse of the new logic of technology, warfare and power − a foreign language exceeding any previous system and seemingly arrived from a different planet. The Futurist concept of “lines of force”− according to which objects reveal their states, emotions and characteristics to the artist or viewer − also hints at a sensibility to presence beyond mere material. The Futurists were prescient in their understanding of the possibilities of art in creating new worlds, reaching beyond received wisdom and reason to see through to the future potential of art, technology and perception, as well as to the darker undertones of these potentials. Was installation art, a genre that came to prominence in the 1970s, the inevitable culmination of the Futurists’ enmeshing of shattered vision and dark geo-political fantasy? A round 300bc, Euclid of Alexandria developed the principles of his geometry to explain and account for physical space according to the coordinates of length, depth and breadth. His laws still govern lay understanding of the workings of space; they constitute our framework for apprehending the places we inhabit and the events that occur in them. However, Euclid’s axioms fail to account for what lies beyond common understanding; his system is ill-equipped to speak of other worlds, the strange, the mystical or the ineffable. Leaving the Euclidean framework behind when approaching a work of art might allow for the emergence of any number of additional dimensions in the space of painting, drawing or photography. Adding a third dimension to the picture plane yields sculpture, while a fourth dimension, time, begets film; but a potential infinity of other dimensions exists in installations, enabling them to operate as other worlds with their own logic and rules. By exploding our conventional notions of space and adding other elements to point, line, plane and time, installations create versions of space that cannot be represented according to Euclidean rules, which is not to say that they cannot exist. The surreal mathematics in the spaces created by a visionary like M.C. Escher may prove to be more useful than Euclid’s axiomatics when approaching the artwork as installation. Artworks then, especially installations, can create their own worlds, exceeding our naturalised means for explaining or experiencing physical space. These territories operate according to their own laws and are governed by their own forces, which in turn construct the viewer in new ways. The physical boundaries the artist has chosen to put into place, positioning sculptural components, outlining moving image projections or extending soundtracks and live performance, limit the space of the installation. But within these borders, a fullness is constituted by a range of effects including a kind of transubstantiation that can also yield the smell of materials and the sensation of textures. The viewer is immersed in this fullness as in a pool of water and acted upon by the different components of the work; sensory effects that create feelings and intuitions that exceed the pure materiality of the installations, creating a surplus and pointing to extra dimensions of physical space and experience. Mark Titchner’s installation When We Build Let Us Think That We Build Forever (2005) is cloaked in a murky soundtrack: the first few notes of the opening fanfare of Beethoven’s 5th Symphony, stretched to the duration of the entire movement. Beethoven’s dramatic symphony, so revered by the young protagonist of Anthony Burgess’s dystopian novel A Clockwork Orange (1962) is here desecrated by special effects, transformed from a glorious composition into a creeping presence. Stretched beyond recognition, ghostly voices and sounds begin to emerge from the vibrations of the track; the pure force of the symphony is isolated, distilled from its melodies and harmonies and thus from its ostensible meaning. Sonic apparitions materialise and populate the space in which it is played. We begin to imagine the symphony, to “see” it, much as Beethoven, who was already suffering serious loss of hearing when he composed it, might have. Along with the other sinister or occult references in the installation, including pictorial signs taken from anarchist torture chambers used during the Spanish Civil War, biblical references and cabbalistic symbols, the soundtrack fills the room with a rich mixture of tyrannical vibrations. This oppressively textured sonic environment contrasts starkly with Laura Buckley’s use of sound in her installation Mechanical Poem (2007), in which a series of clear, sharp sounds is produced by the meeting of clean slick surfaces: squares of pristine materials such as perspex and mirror collapsing together with a slap. The clarity of these punctuating sounds stands out against a murmur of conversation and ambient sounds from the lakeside forest in which Buckley filmed one of the moving image components of the installation. In homing in on the sounds of materials colliding, synaesthesia creeps in: they are such distinctive sounds − nothing else produces that part-sucking out of air between the surfaces /part-fraction of a clatter − that the eye seems to hear the lucid and slick sounds while the ear sees the manipulation of flawless materials. Buckley has noted the importance that sound holds in certain sequences and the influence the soundtracks of her footage have on their editing; the staccato interjections of the hard materials coming together govern the way moving images are cut and intercut. Graham Hudson’s sculptures and installations often incorporate record players and a motley selection of records that demand a new and illogical way of listening. A recurring crossbreed in his work is the outcome of pairing a turntable with a suspended light bulb dangling over it in such a way that the bulb rests on the surface of the spinning record. This dislocation of the usual logic of machines evokes Comte de LautréLamont’s statement, adopted by the Surrealists, about the beauty of “the fortuitous meeting on a dissecting-table of a sewing-machine and an umbrella!”³ Not only does the combination of light bulb and turntable create a visual conundrum by bringing together light, sound, motion and time in a single though multifaceted point, but it also makes for a unique and slippery sonic performance. The turntable struggles to play in spite of the bulb, which repeatedly slides off the surface of the record, dragging it back and causing the music to stutter in a new and baffling language, before crashing into the record player’s arm. In this odd coupling, the records occasionally burst into a proud concert, but more frequently stutter and stammer their way through to the bitter end when their grooves disintegrate, the machine collapses and the record stops playing − only to be replaced by a fresh specimen from the wide collection of records available for the installation. With On Off, which in addition uses a sequencer to switch a series of turntables on and off for a few seconds at a time, Hudson produces a confounding sonic undulation housed in a helical tower whose design might have featured in one of Giovanni Piranesi’s prison drawings. In Laura Buckley’s Cubic 2 (Green Cube Rotate) − one of the moving image components of Mechanical Poem, filmed with a digital video camera set to auto-focus − the action consists of a series of scenes in which a perspex cube is gradually assembled on a revolving plinth, beginning with a base and single side in the first sequence, and culminating in a five-sided open-topped cube in the final scene. During the course of the film, a single light bulb, “a light-based drawing tool”, is variously dangled over and around the cube or positioned in relation to one of its sides.⁴ The rotating planes of colour and transparency, along with changes in the position of the light source, create a motion and a false sense of depth and distance that the camera is at pains to keep up with. Putting such a sophisticated piece of technology in a stressful situation results in something unexpected, hinting at a potential that exceeds the original intentions of the machine’s makers; an exquisite by-product of abuse. This excess produces the art; in the case of Buckley’s films a combination of uncannily precise geometric shots that resemble computer-generated graphics, and blurred sequences during which the camera visibly works through its options, finally settling on a focussed image for a brief moment before the revolving structure returns to disrupt its equilibrium once again. The slick perspex surfaces of the cube occasionally reflect their surroundings, allowing for a fleeting glimpse of the artist, her studio and her camera, while creating another tripartite viewing relationship between artist, sculpture and recording device, and enabling the viewer a momentary access to this charmed world. Such artful misuse of machines or materials − the distressed symphony, the camera put under acute strain in order to capture surfaces and the play of light, the turntable diverted away from its intended use − marks the difference between approaching an instrument as a tool and as a material. 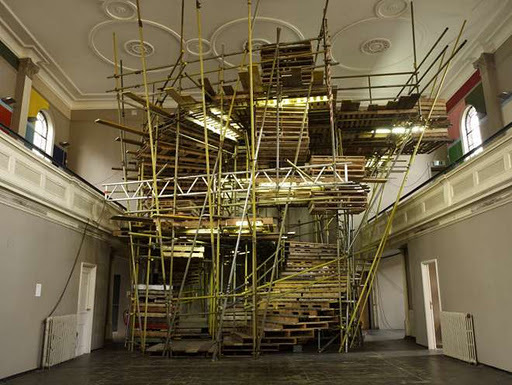 When Graham Hudson uses as his materials standard units such as scaffolding poles, transportation pallets, cardboard boxes and hazard tape, it is with a twofold view to their utility and to their potential to do something other than that for which they were designed. The relationship between artist and material is one of engagement and reconfiguration rather than simple use; it has a different intentionality than the relationship with tools. This difference extends to the distinction between sculpture and architecture, in which the usevalue of buildings is separated off by the sculptural approach and chance comes into play. Distorting the language and logic of machines, parts and materials diverts them away from the pragmatic and guides them towards the poetic. It is this inherent contradiction in the works, which can be mild or acute and which arises from the disjunction between the intention of materials and the uses they are ultimately put to, that enables them to actually work − to have an effect on the viewer that goes beyond a mere contemplation of shape and materiality. Julia Kristeva has written that in an installation “it is the body in its entirety which is asked to participate through its sensations, through vision obviously, but also hearing, touch on occasions smell. As if these artists, in the place of an “object” sought to place us in a space at the limits of the sacred, and asked us not to contemplate images but to communicate with beings”.⁵ It is this capacity of installations to incarnate something entirely new, almost alive, rather than to represent something outside themselves, which constitutes their presence, their surplus value. There is a palpable but uncontainable energy to these works, an alchemy whose elements include scale, materials, ideas and effects. When We Build Let Us Think That We Build Forever contains a number of visual components that act as a sort of pictorial refrain running through the installation. Images are taken from a variety of sources including the Bible and a book about torture cells designed and used in the 1930s during the Spanish Civil War.⁶ The cells bear an uncanny resemblance to sculptural shapes, visual patterns and signs from modernist aesthetic trends and abstraction, making their designer something of a former-day sampler of visual culture, excising elements from their original context and lending them new political and aesthetic significance. The patterns and signs used in the torture cells, avantgarde when first made, are now visual tropes firmly ensconced in the canon of modern art. They are reminiscent of modernist artworks such as Marcel Duchamp’s Rotoreliefs, of Luis Bunuel’s anxious cinematic spaces, and László Moholy-Nagy’s experiments with kinetics, but they also signal a future potential, pointing towards sculptural-perceptual works by contemporary artists such as Carsten Höller, Gregor Schneider and Anish Kapoor. In these torture cells, geometric shapes and patterns were combined with curved surfaces, intense colours, textures and temperatures to create spaces, non-Euclidean worlds, intended to make their victims suffer perceptual trouble and ultimately madness. Their nefariousness is a question of intensity: a lesser intensity in the deployment of these tactics resulted in high art. Pushed to the limit, they became instruments of torture. To know of the origins of these symbols, which now exist in Titchner’s installation in a second-degree abstraction from their original détournement from modernist artworks, is also to be aware of the victims who suffered from being subjected to their forces. These visual elements carry an undecidable presence in the installation: do they laud avant-garde developments in the visual arts or are they indicators of a much darker legacy? Such undecidability recalls the fate of zombies: neither alive nor dead, they roam without hope for closure, unable to be revived or put to rest. The zombies of modern art haunt Titchner’s installation, as do the ghosts of the torture victims who suffered from malicious intensification of avant-garde aesthetic signs. The legacies and tendencies of modern art live on in the work of countless contemporary artists and it is up to the viewer to decide the connotations of progress in the arts and technology; to determine whether the ghosts are friendly or terrorising. In Laura Buckley’s film Cubic 2 (Green Cube Rotate) a two-sided perspex construction sits on a rotating cloth-covered platform, “but then a hand appears to push and expose the driver of the movement and the technical tone is lowered. Including the hand removes the magic and shows you how to do the trick”.⁷ To demonstrate how things work in this way, to reveal the science of movement is also, paradoxically, to reveal their magic, a magic that lies beyond trickery. Revealing the science, the mechanics of the work, paradoxically serves to underscore the surplus that can never be revealed, the part of the work that is untouchable by reason and that operates in accordance with the rules of another logic altogether. The act of revealing the technology behind the work is one way of hinting at the magic. Another is to use technology to reveal something that usually lies beyond our grasp; what would otherwise be inaccessible or unbearable. Buckley’s sculpture Another Place (2007) consists of a naked light bulb hanging behind a sheet of black perspex. This shield protects the viewer from the glaring light waves and allows the red element, alive with electricity, to be seen. Plastic and bulb together allow us to see a thing whose detail would otherwise be ungraspable by the human eye. By framing a light bulb, or filming the reflection of the sun in a puddle as in the film Cubic 1 (2007), Buckley actualises a vision that otherwise would exist only in the realm of the virtual. Sigils are signs, words or devices of supposed occult power in astrology or magic. Titchner’s installation When We Build Let Us Think That We Build Forever includes four lamps with shades whose cut-out patterns are made up of a specific sigil known only to the artist. The lore surrounding sigils tells that when creating a sigil, a particular phrase, wish or spell is reduced to a visual symbol and in so doing, the wish is captured in the symbol, infusing it with a power related to the wish. This sigil technology shares the space of When We Build Let Us Think That We Build Forever with a number of other technologies, all modes of communication: moving image, electronic sound and typography. These technologies aim to affect the viewer with their power, be it merely artificial or decidedly supernatural. By containing and conveying meaning in more or less obscure ways, they demonstrate that no mode of communication is transparent or untainted. In each case − the use of Beethoven’s 5th Symphony, a piece of music associated with the psychological re-programming of a juvenile delinquent in A Clockwork Orange, or the sampling of visual patterns from a mixed legacy of fine art and torture or sigils − the ultimate aim of a particular technology is to exert a specific type of control over the viewer. As writer Kodwo Eshun points out in his analysis of Gothic Futurist Rammellzee, “writing, alphabets, typographies are all ubiquitous elite technologies that have lowered themselves into your consciousness where they adapt you to their habit, their reflex, their perception. The alphabet is not just a transparent communication but a ubiquitous technology, a system adapted and encrypted by successive religious regimes for warfare: the Roma, the Christian, the Medieval, the Gothic. Words, letters, signs, symbols are all weapons, stolen, ornamented and wrongly titled to hide and manipulate their meaning. The prize? Control of the means of perception.”⁸ The magic is that we have assimilated these technologies of communication to such an extent that they seem the natural − the best and only way to communicate. By incorporating them into his installation, Titchner mirrors the constructed artificiality of their role in our daily lives and reveals the underlying strangeness of the way we have wholeheartedly adopted them as organising principles. Such guiding principles control much of our understanding of and interaction with the world. Their ubiquity masks a fear that things might fall apart if we were to risk living according to a different logic. Artworks and installations, by virtue of their capacity to act as containers for the viewer, destabilise and disrupt this compulsion to control. Rather than predetermining meaning or a particular outcome, they allow for unpredictable relationships to emerge, for strange forces to come into play, and altogether different logics to govern our experience in a process that affects and re-creates the viewer as it does the artwork. ⁴ Laura Buckley, Revealing the System: A self-reflexive exploration of practice and methods, artist statement, October 2007. ⁶ Jose Peirats, Anarchists in the Spanish Revolution, London: Freedom Press, 1998. ⁷ Laura Buckley, Revealing the System: A self-reflexive exploration of practice and methods, artist statement, October 2007.